PaintScratch.com sells the highest quality Jeep paint pens for all Jeep years and models. Order a Jeep paint pen for your vehicle by clicking your model above. Next select your Jeep year and color order your Jeep touch up paint pen. Oh no, did you get a paint scratch when you were off-roading your Jeep on some crazy terrain? Well, have no fear, we've got just what you need: a Jeep touch up paint pen. Ok, we realize not everyone is constantly off-roading their Jeeps, and that scratched and chipped Jeep paint happens in all sorts of ways. 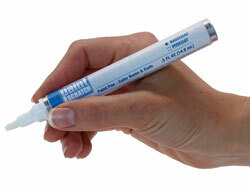 No matter what you drive or why you need it, we've got Jeep touch up paint pens for all models going back to 1966. Thats over 40 models and hundreds of different colors. Colors like Spruce Tip Green Metallic from 1966 and colors from brand new models like Deep Cherry Red Pearl Clearcoat. Just find your Jeep model in our list and order a Jeep paint pen today.